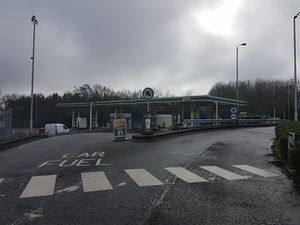 Now little more than a petrol station and a hotel next to the M1, Markfield shows all the promise of being a full service area but doesn't actually achieve it. First two hours free for all vehicles, after which cars and HGVs must pay £6. Prices are paid in the Spar store. The fees are strictly enforced by Euro Garages. Inside when it was open. The first application for a service area here referred to a "drive-in type restaurant". It's not clear whether this was a rookie error, or a reference to a planned restaurant. The service area was built by Granada who wanted to quickly increase their number of sites. They may have been hoping that them opening their Granada Lodge here would stop Welcome Break expanding Leicester Forest East. As a result, they used the name Leicester, but on this website we would tend to stick to Markfield to avoid confusion. It had a simple cross-shape with a restaurant, shop and toilets. Moto inherited the services with an amenity building with a retail store, Burger King and a Little ChefHistory. 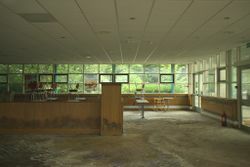 Over six years, the building was deprived of its facilities and eventually closed in 2014. Mobil owned the filling station and sold it to BP. The filling station is still owned by BP but Euro Garages operate it on a leasehold basis, and they refer to it as Markfield. The services opened with a Granada Country Kitchen Restaurant, which became AJ's, and then Little Chef. 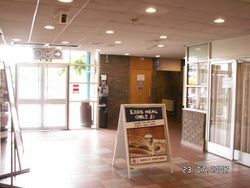 The Little Chef and shop closed in 2008. The Little Chef became a Moto-operated Costa and was then closed again, leaving a large empty space next to the Burger King unit. The entrance was moved from the side of the building, to a new porch leading to the restaurant. Moto sold the main amenities building to Euro Garages, who added a Coffee Nation machine, but then closed the whole building in 2014. This appears to have been a short-notice decision as posters and furniture from the time are still visible inside. Lots of mould has gathered around the partition next to Burger King and within the former Costa unit. The entire building has flooded and the floor has worn away. Very little attention is paid to this site: everything is tired and overgrown. As of 2018, the main building, children’s play area and all other land except the petrol station and hotel is fenced off.